No one ever seems to think of a Classic Vegetable Soup as being budget minded, at least imho, it’s more just one of those recipes that everyone pretty much knows and loves regardless of price. I see Vegetable Soups like this in various forms on restaurant menus, those soup warming pots in grocery delis (is anyone else afraid of those?) and of course, I grew up on vegetable soup. Hello Campbells, I see you there! When I used to make Classic Vegetable Soup, I didn’t even really use a recipe, which brings up the point that when you make your own, you can put just what you like in it. Provided it’s veggies, right, or it won’t be Vegetable Soup. Then one day, I was watching the show, The Best Thing I Ever Made. Alton Brown was on with his recipe and a tale of how he spent years perfecting his Winter Vegetable Soup. So what did I do? I stole it and tweaked it! Sorry, Alton. Alton started out with mushrooms, finely chopped and really browned as the start of his flavorful soup, so I tried it and loved the umami flavor it added. Then in went two other flavorings, the ones you don’t usually see in Vegetable soup, a Parmesan Cheese Rind (I always save mine) and a little Soy Sauce. So Alton was grabbing flavor from across the globe, but his original soup did have a decided Italian flavor. I toned that down in my Classic Vegetable Soup. And then I pretty much stuck to the flavors I grew up with in Vegetable soup. The tomato base with onions, celery and carrots, then to finish, a good amount of cabbage and potatoes. To me, growing up in the Midwest, this is really the Vegetable Soup I love. I nixed the squash, just because I could never warm up to it, the kale, which we didn’t used to be able to even buy (but of course, we can get it now, and I do love it, but I have cabbage, instead) and the beans….those to me all those flavors scream Minestrone. Brown the mushrooms and onions well – they’ll be the basis for the flavor. Make sure when you make this soup to cut the mushrooms small, they’re in bits, really, and then very well browned. Do you have haters in your family? Well, those mushrooms shrink so much during the process that when the soup is finished, they don’t look like anything more than bits of pepper floating around. And while I toned down the Italian influence, I did keep a little Rosemary and the Sage in the soup. Add whatever herbs you like. And I added one thing I love in vegetable soup, a bit of Midwestern German background. A touch of vinegar at the end. For lighter tasting soups like this, I like a dash of white or white wine vinegar, but red wine or balsamic is great also. Of course, Alton Brown is no doubt a Master in the kitchen, and if you want to make his original recipe, which is outstanding, just not quite the vegetable soup I wanted, it’s getting harder to find. It was called Winter Vegetable Soup, and I linked you to the video, above and I can link you to “Copy Me That” a site that takes other peoples recipes and reprints them. If you’d like to see some of my other Soups, see my Soups, Chowders & Chilis. Any vegetable soup, as long as you’re using your basic veggies and especially if you’re not fortifying them with pricey broths or stocks is going to be downright cheap. When I originally made this soup in 2012, it ran under three bucks. These days (2019) mushrooms are much higher (even though I use the basic white buttons, which bonus – are just as healthy for you as their more expensive counterparts) and cabbage is higher, although if you shop well, potatoes, carrots, celery and onions have all pretty much stayed the same. Most veggies are cheapest in the larger bags. I love to serve Classic Vegetable Soup with my ultra delish and pennies to make Crusty Bread. This is the five minute to mix together, let sit overnight and then bake bread. So much flavor for so little effort! Place 2 tablespoons of the olive oil into an 8-quart stockpot over high heat just until the oil shimmers. Add the mushrooms and saute until browned, about 5 minutes. Remove the mushrooms from the pan and set aside. Add the tomatoes and juice, crushing the tomatoes as you add them, sage, rosemary, and garlic, and cook for 5 minutes, stirring to break up the tomatoes. Add the water, soy sauce and Parmesan rind, increase the heat to high and bring to a boil. Turn down to a lively simmer for about 15 minutes. Decrease the heat to low, add the potatoes and cabbage, cover and cook until tender, 30 to 35 minutes. Return the mushrooms to the pot along with the vinegar and cook until all is heated through about 10 minutes. Remove the cheese rind, add freshly cracked black pepper and serve. 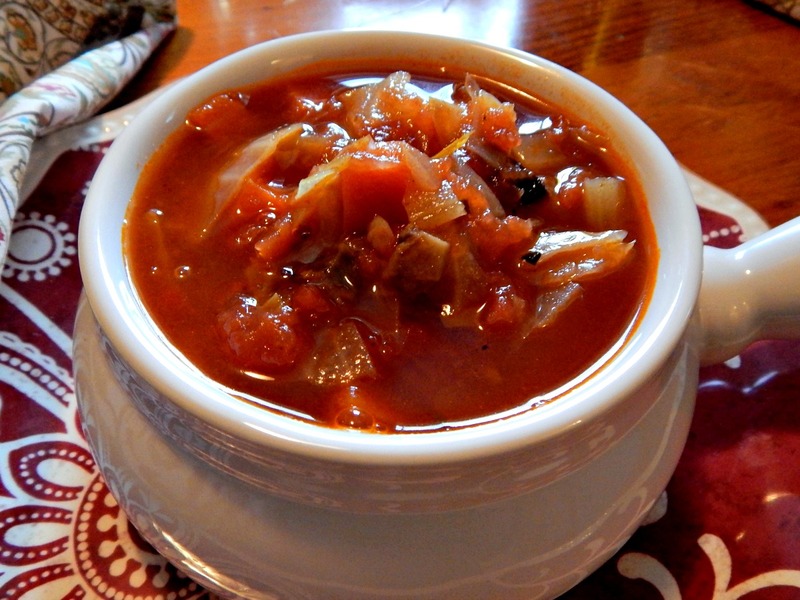 Vegetable Soup freezes wonderfully – consider doubling the recipe and freezing half. This entry was posted in Click here for Bargain Meals, Click here for Fabulous Food Posts and tagged Alton Brown, Bargain Meal of the Week, Cabbage, Carrots, Freezes Well, mushrooms, Potatoes, Soup, Tomatoes, Vegetarian Meal. Bookmark the permalink. Thanks so much! And congrats on you five years blogging! Whoohoo!! Thank you so much dear. Yayyy!! !